Mental Health Outcome Evaluation bridges the gap between traditional research and evaluation methods by presenting an alternative to the highly technical and statistical methods developed in the laboratory for mental health care professionals. It focuses on outcome evaluation of mental health services for adults, concentrating on the general principles that can be used to assess the service effectiveness of community health centers, clinics, and private practices. 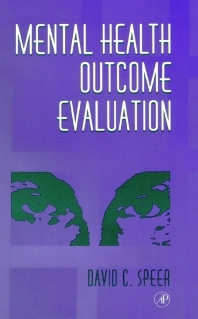 The book presents a formidable argument for descriptive outcome studies through its evaluation of the results and consequences of care and treatment as well as clinician ratings. It is written in a non-technical style, making it accessible to anyone in the mental health industry. Why Evaluate Mental Health Service Outcomes? So, How Do We Tell if Something Works? David Speer (Ph.D., University of Minnesota) is an associate professor and clinical research psychologist at the Florida Mental Health Institute at the University of South Florida in Tampa. His duties include consultation, education, and training services to the public mental health system for older adults, grant writing, and clinical research. Before coming to Tampa, Dr. Speer was a Post Doctoral Fellow at the University of Notre Dame from 1986 to 1988 and was an executive director of the Northeastern Center (a CMHC) in Kendallville, Indiana from 1982 to 1986. He has also served in executive positions at the Quinco Consulting Center in Columbus, Indiana and the Erie County Suicide Prevention and Crisis Services in Buffalo, New York. He has authored or co-authored 45 journal publications and is the editor of Nonverbal Communication, Sage (1972). The Louis de la Plarte Florida Mental Health Institute, University of South Florida, Tampa, Florida, U.S.A.
"In the absence of information about quality of care, mental health policy makers have had to make decisions about the allocation of services solely based on costs. This book demystifies the world of empirical research and provides a comprehensive, user-friendly framework for understanding the clinical and policy implications of scientific evidence. At long last, it is possible to use relevant clinical information for evaluating the treatment of our patients and for guiding the delivery of mental health services." --KENNETH I. HOWARD, Northwestern University, Evanston, Illinois.